After being on the new job for over two weeks now, I finally have an organized and decorated cube that I am proud of! One of the staple pieces I chose was this cute little rose gold frame that I painted myself. I was really pleased to find some really realistic looking faux roses, since I’m allergic to real roses and don’t feel like spending that kind of money on the regular. 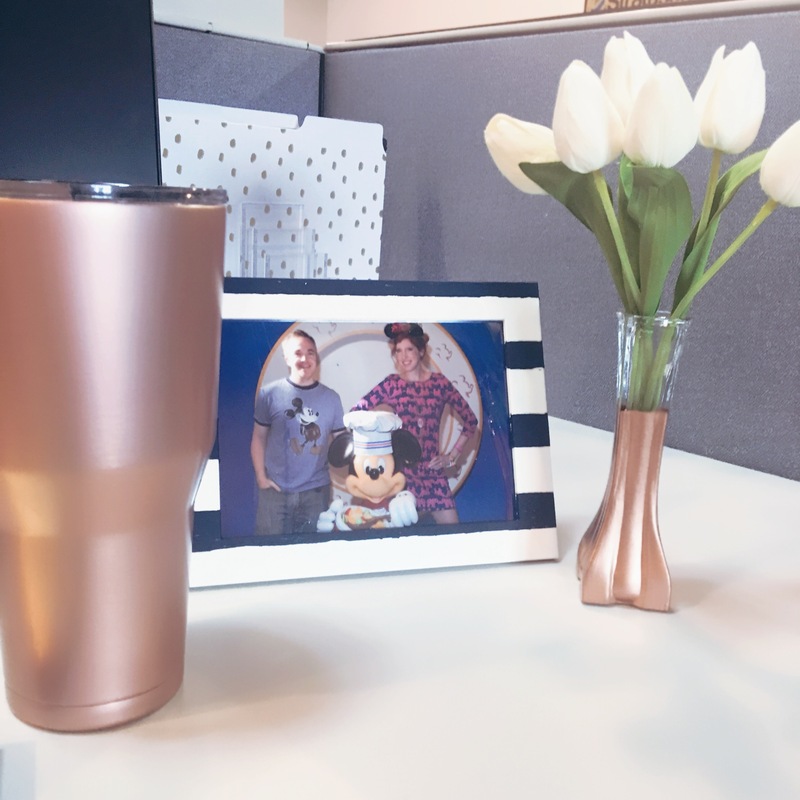 I just love how the rose gold of the vase perfectly matches the rose gold Yeti my husband got me for Christmas. In the background you can see the sleek file organizer I got, along with some fun gold flecked folders. And of course, you can check out the Kate Spade inspired navy striped frames I made. 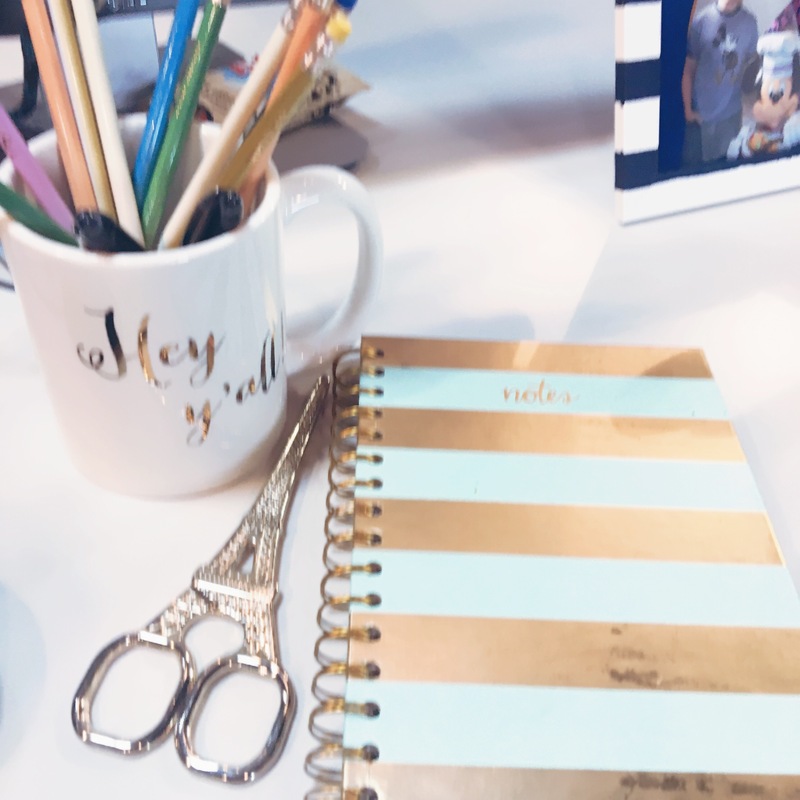 On the other side of my desk, I put the matching clear and gold tape dispenser and stapler – so much classier than a dingy old Swingline stapler and roll of Scotch tape! I also found this cute little gold dotted candle and gold rimmed ceramic tray to keep knickknacks like my EOS lotion. 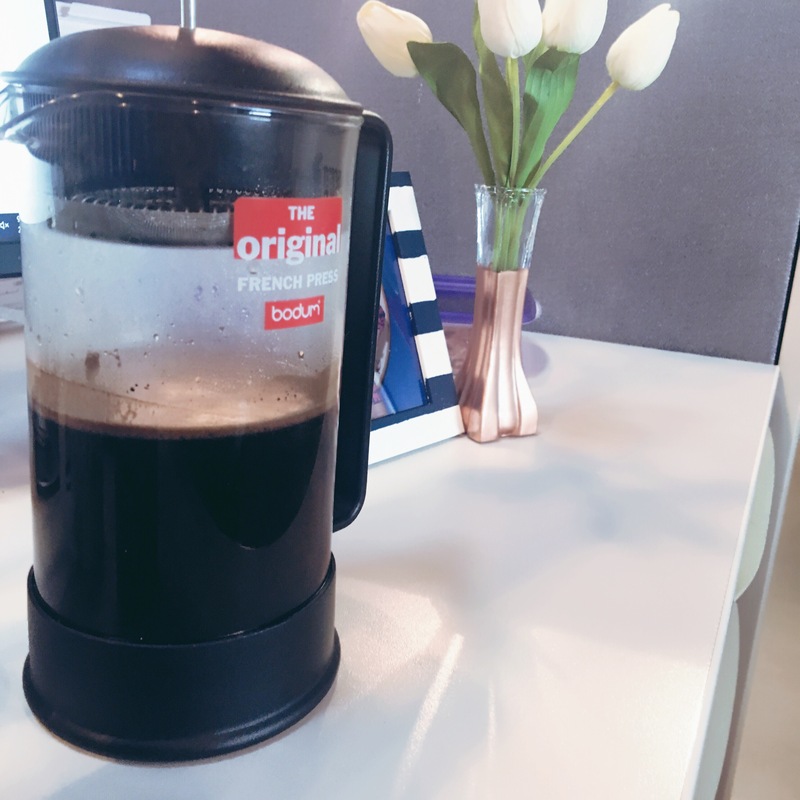 And let’s not forget the trusty Bodum French press, for those moments when regular old office coffee just won’t cut it. Finally, I stocked up on pastel ombré pencils to fill my gold lettered mug, along with this pair of gold Eiffel Tower scissors. And there you have it, an oasis at the office! In my 35 years as an office worker, I’ve never really seen anyone decorate a cube with a motif. Have you gotten comments from your co-workers about this? I have been WAITING to see what you ended up with, I love how elegant and chic it is!!! Ugh, so cute! ERMAGERD!!! SO FREAKING CUTE. I am LOVING gold right now!! Is that soap in the holder?? Thank you, lady!!! I’m so in love with gold tones too. It’s actually a bottle (if you can call it that??) of EOS lotion. The same people who make those addictive little balls of lip balm apparently make other addictive goodies. I’m skeptical about how tiny it is – I apply lotion to my hands all the time during winter, so I doubt it’ll last long, but it fits perfectly in my knickknack tray! OH! I have some of those. I put lotion on at least 342 times a day, so I get it. I have jumbo lotions all over the place. In my purse I have a full size B&BW lotion at all time! It looks lovely. I love the gold colour theme. Very snazzy cello tape and stapler. I hope it helps you to feel more settled in your new job. Hahahaha – you’ll just have to make a point of lending it to people instead or maybe you could make a small piece of artwork using staples! Thank you!! It does feel nice to have a pretty little oasis, especially given that I am in a small cube next to many, many others. Designing an at home office is trickier than it seems like it should be. Well, perhaps not so much tricky as expensive. I’m in the market for a new desk for my home office, and I’m blown away by the prices. 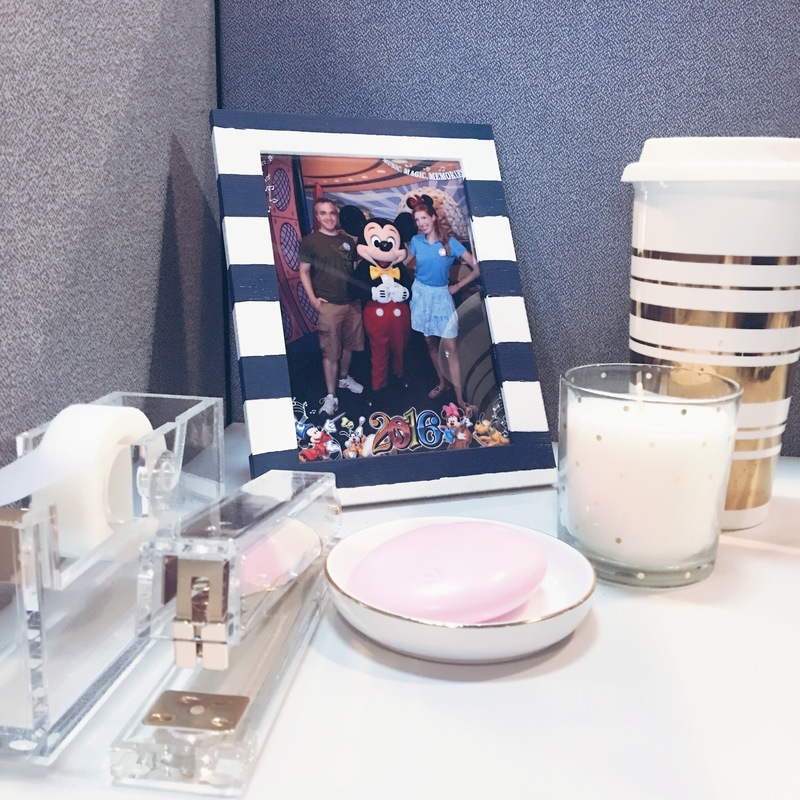 Love your little office desk decoration, Charlotte. Rose gold is the trend right now. You can see it in interior design, fashion and even beauty. I’m already visualizing my new job and office desk. I might go with rose gold deco also :). Hopefully you’re enjoying your new work place. Have a lovely week ahead! Thank you so much, Jey!! I am obsessed with rose gold for sure. I hope you are having an awesome week too!! I have the same acrylic stapler/tape dispenser! It’s so funny how having a cozy space really does make you feel so much more inspired at work!